The Northern Arizona Suns took down the defending D-League Champion Sioux Falls Skyforce 98-89 on Sunday afternoon at the Prescott Valley Event Center pushing their record to 5-1 and remaining un-beaten at home so far this season. The day basketball fans in the quad cities were waiting for finally came on Saturday night as the Northern Arizona Suns opened their inaugural season with a 122-107 victory over the Iowa Energy at the Prescott Valley Event Center. Correspondent, Torrence Dunham has the story for PrescottValleyeNews.com . After three postseason appearances, the 2016 Bears squad takes the field with a less experienced group. Through hard work, the Bears are looking to grow the young team and enter the postseason for a fourth straight year. Freelance Daily Courier Sports Reporter Torrence Dunham has the story. Video in 4K where available. The Diamondbacks are chalk-full of former D-backs players this spring helping the current team reach their goal. Cronkite News reporter Torrence Dunham talked with former Diamondbacks second baseman Orlando Hudson on Wednesday as he gets the opportunity to return to his old team and coach the young Diamondbacks infield. After spending most of his minor league career as a catcher, Peter O’Brien was called up to the Diamondbacks last year as an outfielder. This spring, he continues to work on his outfield skills. While there have been some rough spots in the development, manager Chip Hale believes O’Brien can improve at the position and has been impressed with O’Brien’s arm and accuracy. Cronkite News reporter Torrence Dunham caught up with Peter O’Brien at Diamondbacks camp on Friday to talk about learning the outfield. Spring Training games are in full swing here in the valley of the sun. Since the weather is so nice, fans bring out blankets to sit on the grass to enjoy the old ballgame. Cronkite News reporter Torrence Dunham talked to fans about deciding to take in the game from the grass and also the benefits of having complementary sunscreen just steps away. Nicknames have been a part of the Diamondbacks past since the beginning with names such as The Big Unit, O-Dog and Gonzo. This tradition continues as Cronkite Sports Reporter Torrence Dunham caught up with David Peralta and Welington Castillo to find out the origin of their nicknames. Arm and elbow injuries are a problem facing many pitchers in the game of baseball today. The pressure to perform at the highest level has pushed some pitchers to train year long. However, some believe this could have long lasting effects. Cronkite News reporter Torrence Dunham has the story. Below is a series of packages I did while reporting at the 2015 Special Olympic World Games in Los Angeles, California that was posted on the Game’s official Youtube page. MESA, Ariz- The Yavapai College Roughriders soccer team tied Phoenix College 1-1 at home Thursday, September 14th, putting off program win #600 for a couple more days. It didn’t take long for the Roughriders to take control of the game against Mesa Community College Saturday, September 16th, with four goals in the first 20 minutes of the game in route to an 8-0 victory and program win #600 at John D. Riggs Stadium in Mesa, Arizona. Roughriders soccer head coach Michael Pantalione started the team in 1989 and the program has since gone on to win seven NJCAA National Championships out of 13 appearances with the nation’s best winning percentage of over .900. The 600th program win adds another bullet point to the long list of achievements in Roughrider soccer history. “There is no magical formulas, it’s all about hard work,” Pantalione continued. PRESCOTT VALLEY- After observing many of his players receiving the call-up to the NBA during the Northern Arizona Suns inaugural season in 2016-2017, head coach Ty Ellis received that call himself. As the team announced on Tuesday, October 24th, Ellis is one of three NAZ Suns coaches joining the NBA team following a Phoenix Suns staff shakeup. Ellis, Associate Head Coach Bret Burchard, and Assistant Coach Brandon Rosenthal were called up to join the Phoenix Suns coaching staff following the Sunday, October 22nd, dismissal of Phoenix Suns head coach Earl Watson. The three will now join the staff under interim head coach Jay Triano. PRESCOTT VALLEY- The Northern Arizona Suns took 100 shots on Tuesday night, November 21st, against the Austin Spurs at the Prescott Valley Event Center but only 35 shots went in the basket as the NAZ fell to the Spurs 101-98. PRESCOTT- As the month of November nears conclusion, the second-year Embry Riddle women’s basketball team has yet to be defeated this season and continued their impressive start on Monday night, November 27th, at home with an 86-47 victory against Bethesda University. PRESCOTT- The Prescott High School baseball team committed four errors in the first three innings, six total throughout the game, against the Thunderbird Chiefs on Friday afternoon and lost 7-0 at home. PRESCOTT- The clouds might have covered the sky and the temperature was a bit chilly, but baseball is back nonetheless as the Prescott Little League celebrated Opening Day together. Hundreds of kids and coaches were on the field being introduced while family members and friends watched from the stands at the Bill Valley Fields in Prescott on Saturday April, 1st. PRESCOTT VALLEY- Bull riding fans in quad cities know the name Cody Nance, as he took home the Mile High Professional Bull Riding tournament championship in 2016. In front of a packed crowd in the Prescott Valley Event Center on Saturday night, Nance competed against over twenty-five other riders and successfully defensed his title to win the $15,000 prize. PRESCOTT VALLEY- Bradshaw Mountain High School softball seniors Katie Grandy, Shelbi Audsley and Randee Clifford each got two hits against state top-ranked Cactus in the final home game of their careers on Friday afternoon, but the Bears couldn’t complete the comeback and fell to the Cobras 7-3. PRESCOTT VALLEY- Friday night at the Prescott Valley Event Center was a moment Prescott High School Badgers’ senior wrestler John Dwyer has been working toward for the last four years, standing on the pedestal as a state champion in the division-three 195-pound weight class. PRESCOTT- It was just over a month ago when the Prescott High School Badgers played their rival Bradshaw Bears in Prescott Valley and lost in the last seconds of the game after being ahead for most of the contest. On Tuesday night at Prescott High School, the Badgers were looking for vengeance. PRESCOTT VALLEY- The Bradshaw Mountain Bears drained a last second free-throw to win their first game of the season against the rival Prescott Badgers 56-55 on Monday night in front of a packed gym at Bradshaw Mountain High School. PRESCOTT VALLEY- Four NCAA division-one hockey programs are hitting the ice this weekend at the Prescott Valley Event Center as 2016 draws to a close. The Desert Hockey Classic will be making its first appearance at the Prescott Valley Event Center after being hosted in Glendale the previous year. The teams will include Arizona State University-who is playing their second season as a division-one team-, University of Connecticut Huskies, Brown University Bears and the St. Cloud State Huskies. PRESCOTT- All-American and Prescott High School standout wrestler Max Payne is back in a comfortable area; the mats of his old high school as a coach. Payne has been on the wrestling scene in the quad cities since he was six-years-old. He competed throughout his schooling including the Prescott High School team, where his dad was the coach, and later grew into one of the best wrestlers in the country achieving All-American status during his collegiate career at Montana State University Northern. 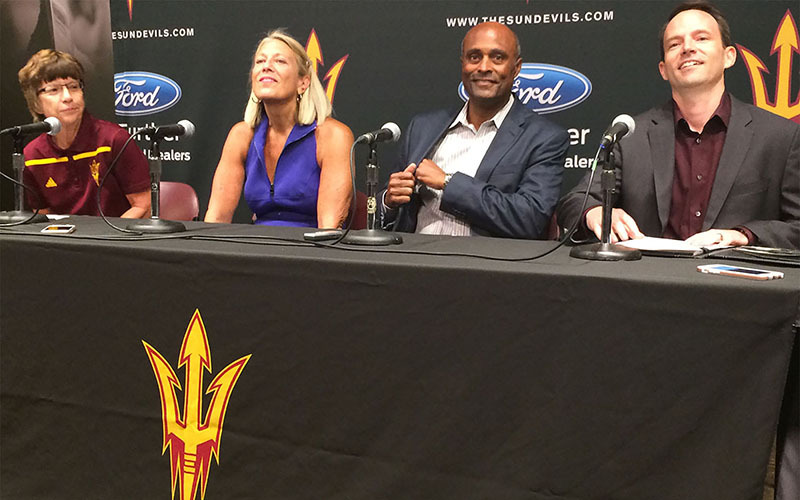 TEMPE – From the day he arrived at Arizona State in 2014, Ray Anderson has worked to make the university a destination for Olympic hopefuls. “Part of my desire coming in was (ASU) President (Michael) Crow’s aspiration that, in fact, we would be able to make Tempe, this area, the Olympic training center, the place where people can aspire to be Olympians,” said Anderson, ASU’s vice president for university athletics and athletic director. In an athletic department that has already added current and former Olympic coaches in wrestling’s Zeke Jones and swimming and diving’s Bob Bowman, and attracted the likes of swimming legend Michael Phelps to train on campus, Anderson took another step toward his goal Wednesday. He announced that men’s tennis would return to the varsity level for the first time since 2008. Anderson, along with his wife, Buffie, donated $1 million to the program. In the fall of 2001, the Valley was painted purple and teal as the upstart Diamondbacks, just four seasons into their existence, were locked in a World Series battle with the storied New York Yankees. Down by a run in the ninth inning of Game 7, Arizona’s Mark Grace started a comeback rally that would culminate in Luis Gonzalez’s World Series-winning broken-bat single. That game has been immortalized in Arizona sports history, along with the old purple-and-teal jerseys worn by the franchise’s only World Series winner. The announcement that the Copa America Centenario would bring international soccer matches to the Valley next summer was cheered by local officials who believe the powerhouse tournament will foster the development of the sport in Arizona. At the center of this is the development of the game among the state’s youth. The Arizona Diamondbacks have shed their skin for the second time in franchise history. On Thursday night at Chase Field, the Diamondbacks unveiled seven brand-new bold uniforms with designs that are a clear nod to a younger demographic and the next generation of Diamondbacks baseball. 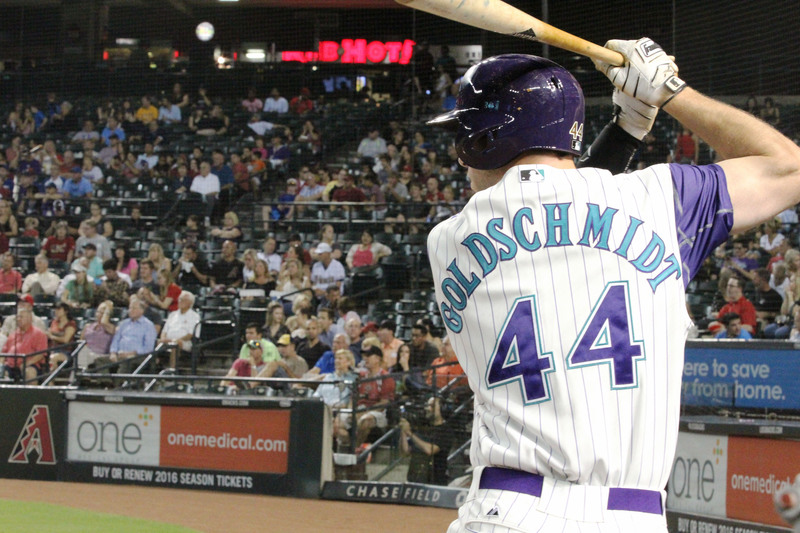 The Diamondback’s original threads featured pinstripes with a purple and teal color scheme, which the team wore from its inception until 2006. Following the 2006 season, the Diamondbacks ditched the purple and teal pinstripe design for Sedona red, Sonoran sand and black. Former NBA coach Jeff Van Gundy, now an analyst with ESPN, says replacing coach Jeff Hornacek is not going to solve the Suns’ woes this season. Valley resident Kyndall Holstead did not attend the University of Alabama but has become a fan of the football dynasty Nick Saban has built there.